sweet potato and sausage soup. So, I have this problem where I am hungry all the time. Most days, I could eat my lunch at 10 a.m. And now that I go to the gym right after work, I’m not eating dinner until 8pm. This just means I need something hearty and delicious for lunch that will hold me over. I love soups for lunch. 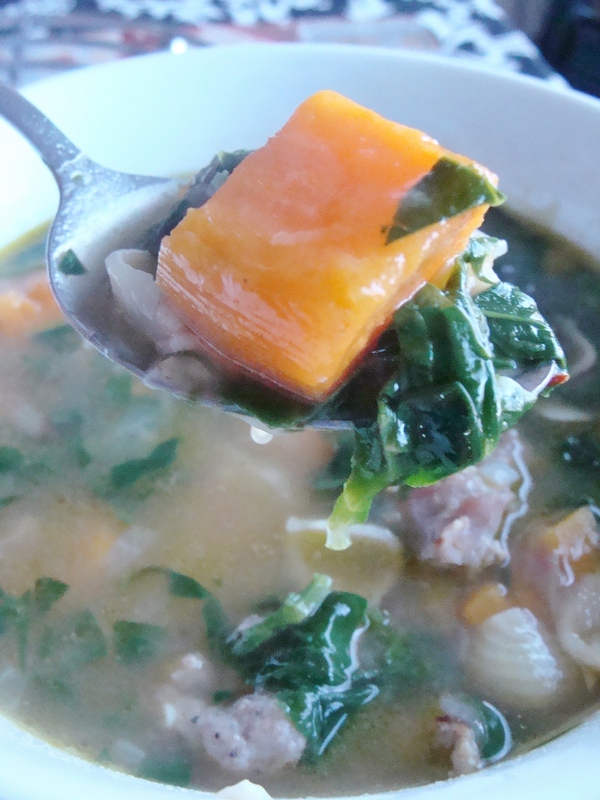 This sweet potato and sausage soup is a WINNER. Hearty? Check. Delicious? Check. The soup was so steamy, all my photos are slightly foggy. Foggy with awesomeness. First, prep your ingredients. Remove the casing from your sausage, if needed. Peel and chop your onion and sweet potatoes, and mince your garlic. Chop your spinach, and grate your Parmesan. Ready? Here we go! Heat your olive oil in a large nonstick Dutch oven or soup pot. Add your onion and garlic, and cook until soft. Then, add your sausage in small pieces. Cook until the sausage is browned. Now, add your chopped sweet potatoes, broth, and water. Bring the pot to a boil, then add your pasta shells. Cook for about 8 minutes, then reduce to a simmer. Toss in your chopped spinach. Keep simmering until the greens wilt and the pasta is tender. Top bowls with grated Parmesan! EDIT: Something funky happened to this post after I published it on 11/5, and it reverted to a draft. Re-published on 11/6. Sorry for weirdness! 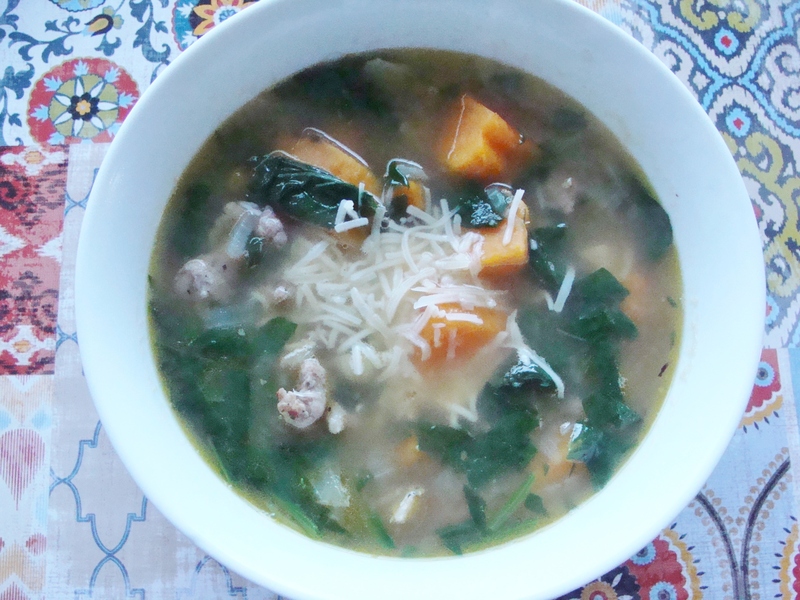 § 5 Responses to sweet potato and sausage soup. Sounds great! I’m usually thinking about what I’m going to eat for lunch before I’ve even finished my morning coffee, this is definitely a lunch to look forward to! « slow cooked beef short ribs. 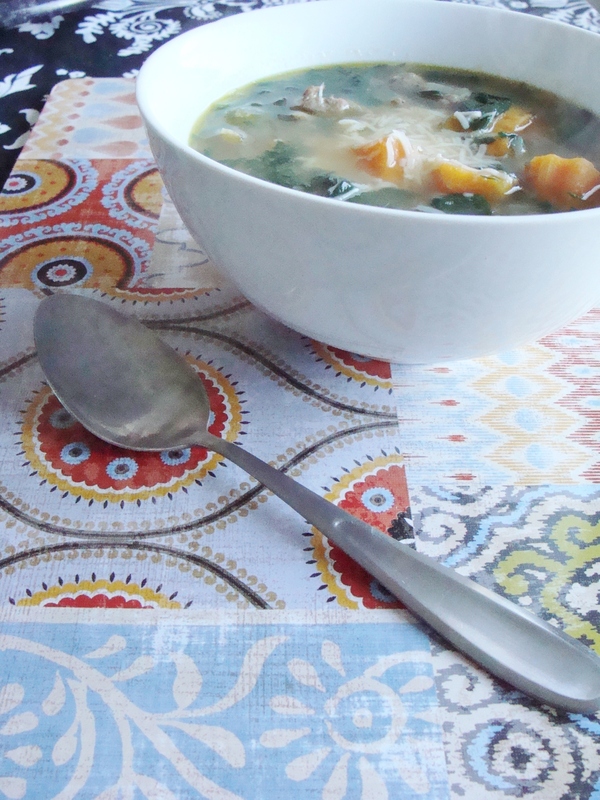 You are currently reading sweet potato and sausage soup. at The Cheesy Kitchen.